Many thanks to those who commented about the tiny elephant, I'm glad you liked it! 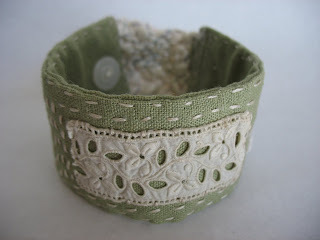 I'm uploading this picture of a new fabric cuff bracelet via Picasa. It worked! I love that program - it's free from Google if you're interested (it keeps my photo uploading very organized). More views and some description of this cuff can be seen at my flickr site. For now, it's not going into the etsy shop, but there are still other fabric cuffs available there. Today I'm working on Alma Stoller's Art Doll challenge from her recent zine. I'm very used to making dolls a certain way - but since the creative well seems to have dried up in the doll department I'm going to follow her directions as close as possible. If some creativity pops up along the way... I'll go with it. Of course I'll put some pictures here, too.